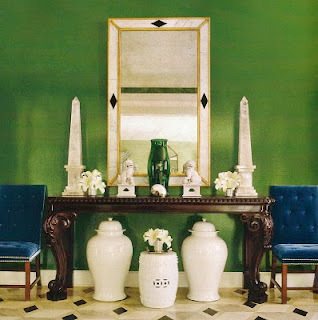 Auction Decorating: Obelisks add instant chic! 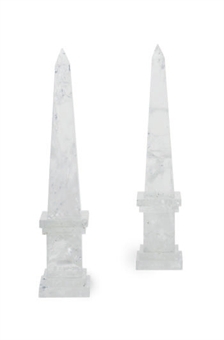 Decorative obelisks are so simple, but add SO much chic to your decor instantly. They are architectural, and can be made of materials that add even more interest. One obelisk, or even better a pair, just set down on a table, or placed on a mantle immediately dress it up. They work in traditional decor, and are very modern at the same time. The materials can make the difference. 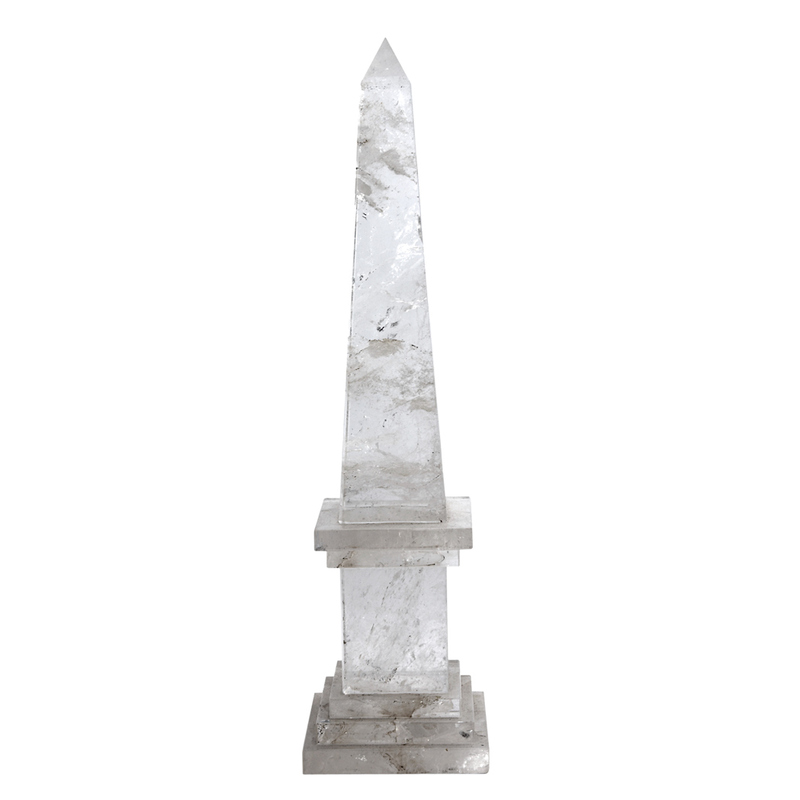 Think of a rock crystal column in a cool white space, or an elaborately mounted marble in a more traditional setting. One of the best ways to start before bidding for your obelisk at auction is to do some research on past auction sales. This way you'll have an idea of prices and offerings. Christie's has a great database which is easy to search (not all of them are). I found these two examples. 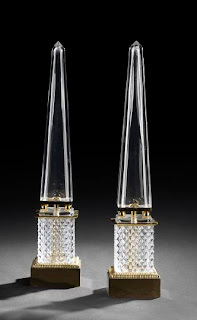 The first is the pair of rock crystal obelisks on the left. They stand 17.5" tall and sold for $1,188. They are 20th century and would be so smart in a sleek decor. 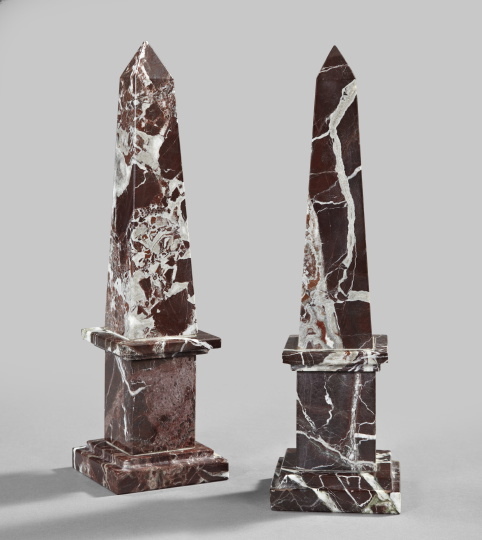 On the right, this pair of 19th century Northern European faux porphyry marble and painted marble obelisks are a more traditional choice. They stand 18.25" tall and sold for $1,625 off an auction estimate of $2,500 - $3,500. There are lots of examples that are less, and some very much more. 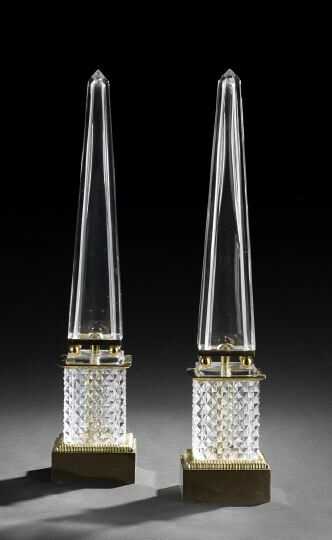 This pair of French gilt brass mounted cut glass obelisks caught my eye for their modern design. These are Lot 383 at the next New Orleans auction January 29th and 30th. They stand 21" tall and have an auction estimate of $800 - $1,200. The sister auction house in New Orleans, St. Charles Gallery, sold these French marble obelisks for $492. I think these are a bit chunkier in design, but I like the simplicity of a single material, which in this case is a very interesting brown marble. And they were affordable too! 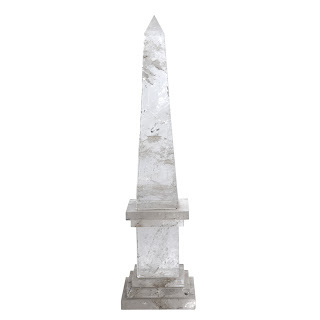 At the next Doyle New York 'Belle Epoque' auction being held February 9th this single neoclassical style rock crystal obelisk is on offer with an auction estimate of $800 - $1,200. It's 22.5" tall and is Lot 400. This single obelisk is more elaborate than some of my previous examples. This is Lot 635 at the next Christie's New York 'Interiors' sale being held February 8th and 9th. 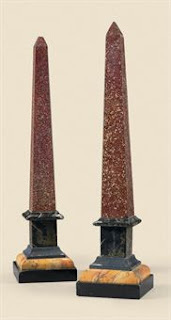 It is described as an either English of French, late19th century gilt bronze mounted specimen marble obelisk. It's 16" tall and has an auction estimate of $800 - $1,200. It has very smart decorative detail on the base, and would dress up any shelf, table or mantle. 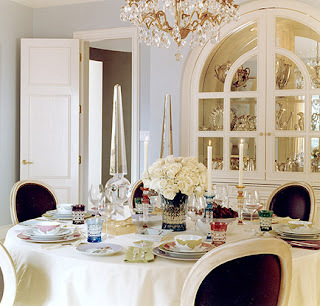 On this dining able designed by Suzanne Kasler, the addition of a pair of clear crystal obelisks makes for instant chic decoration. Find a few at auction and move them around your home to give whatever space they are in the perfect updated look.